Good Morning everyone and happy Tuesday! Welcome back from Creativation weekend! I was watching from home and it looked so fun! 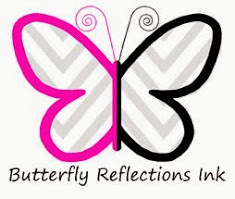 It was so exciting to see all the sneak peaks of the fabulous new products that I am sure will be hitting the Butterfly Reflections shelves soon! I’m here on the Butterfly Reflections Ink blog today sharing a card that I made for a crafty friend! TGIF everyone!! Hope everyone is looking forward to the weekend! Today I am sharing a fun and festive Christmas card using Concord & 9th Merry and Bright die along with Happy Plaids stamp set.